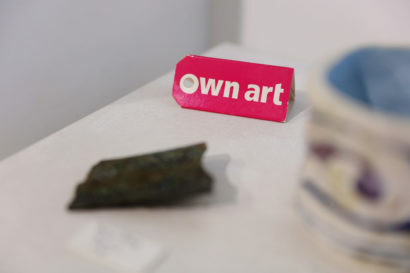 We are delighted to be members of Own Art , a scheme funded by Arts Council England that makes it easy and affordable for everyone to buy contemporary art. Own Art allows you to spread the cost of your purchase over 10 months with an interest free loan. And with hundreds of original works of art to choose from, you could start a collection of your own today from as little as £10 per month. The first stage is the tricky bit – deciding what to buy! If you’re a first time buyer our friendly and informed team will ensure that buying art doesn’t need to be a daunting experience. If something has caught your eye, we can give you more information about the artist, what inspired them and how they created the work. Knowing more about how and why the work has been made will develop your understanding of the artist, and maybe make you love it all the more. After you’ve chosen your artwork we will take you through the loan application process, which normally takes about 10 minutes, following which you’ll get an instant decision. Pop into our Ealing Gallery where the team will be able to talk you through the scheme and help with any other questions you might have. We believe owning art does not have to be a daunting process. The Own Art scheme, being a trustworthy and reliable alternative method of collecting, can turn anyone from a ‘window shopper’ to an excited owner of a collectable loved piece of original artwork.